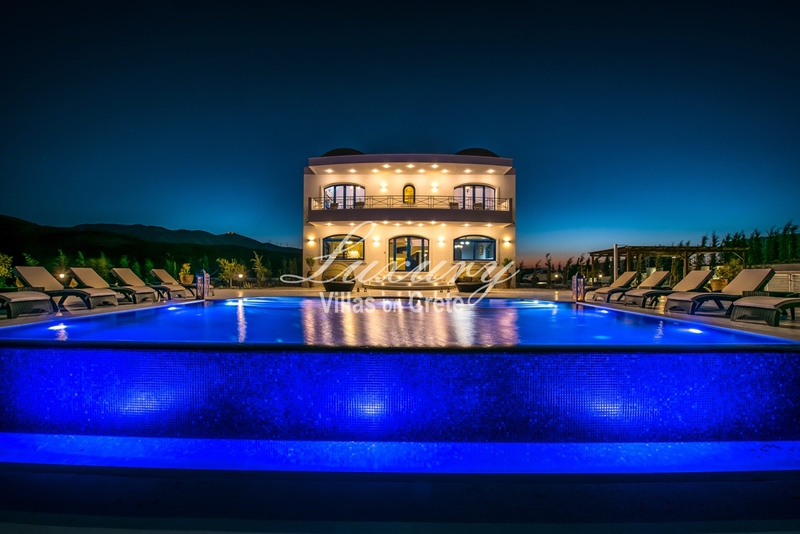 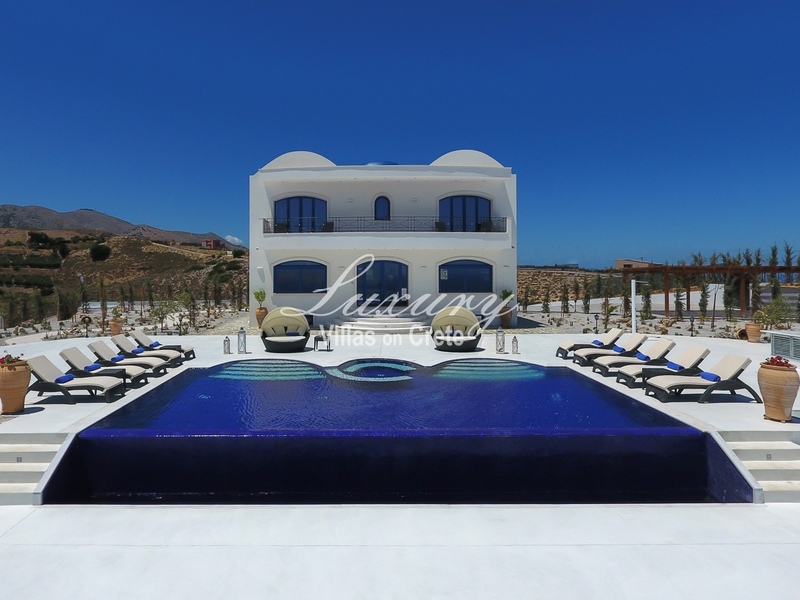 Villa Santorini is situated in Rogdia on Crete Island, 10 kilometres away from Agia Pelagia, a beautiful beach resort town, with numerous tavernas and nightspots, just 30 minutes from the Heraklion airport. 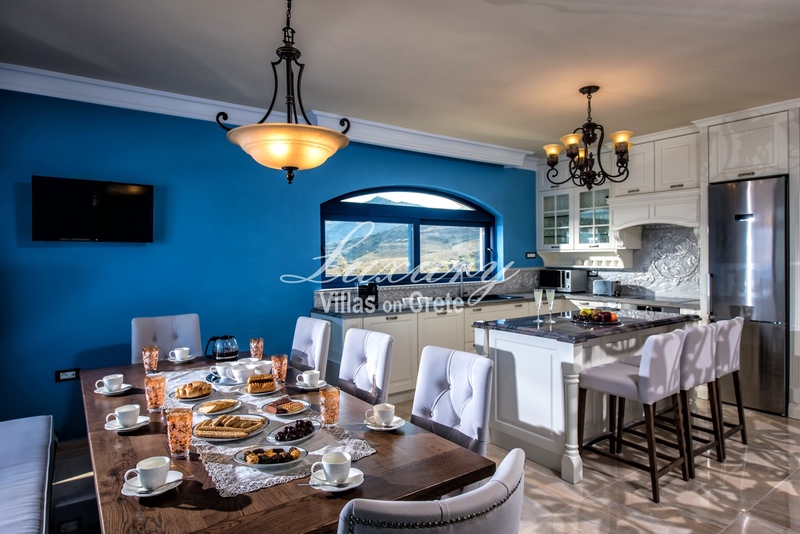 Villa Santorini sits upon a dramatic cliff that places it between the sea and sky that will take your breath away. 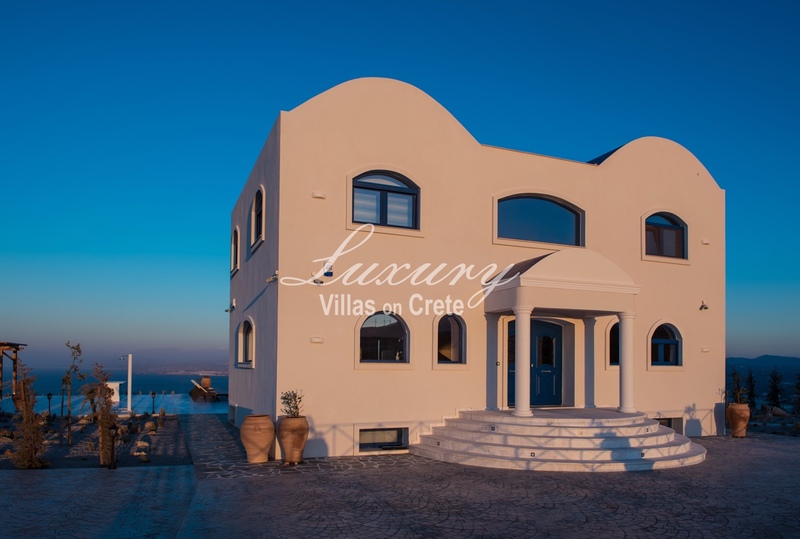 The villa is above the beach of Lygaria, about 400 meters above the beach and only 15 minutes away by car. 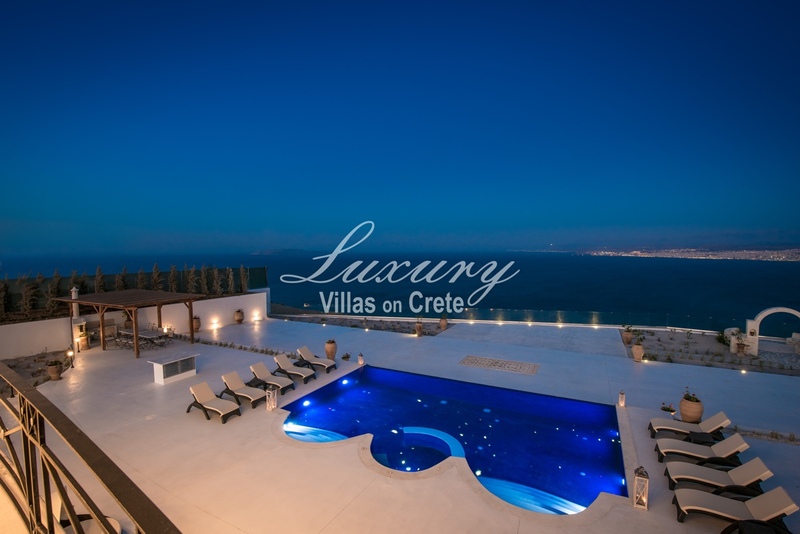 The villa surrounds the guest in light and sense of the glorious sea as it has existed for thousands of years. 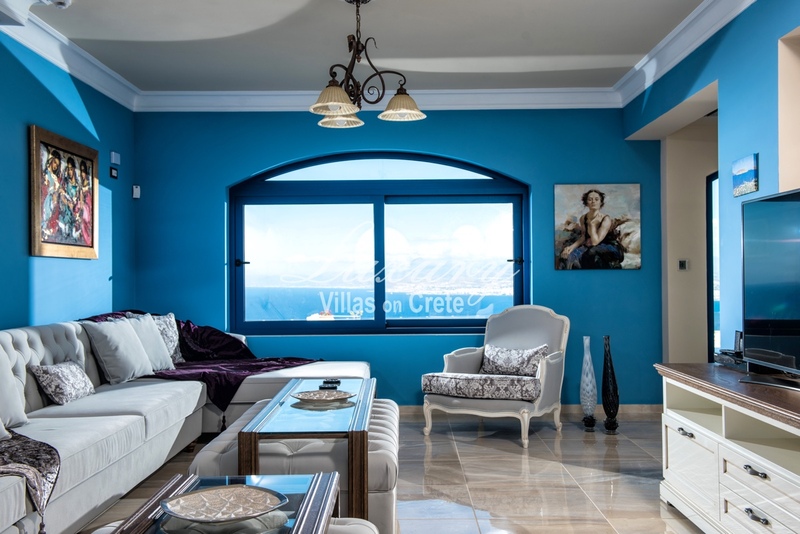 One can imagine the ancient ships of Oddesseus arriving in the distant horizon. 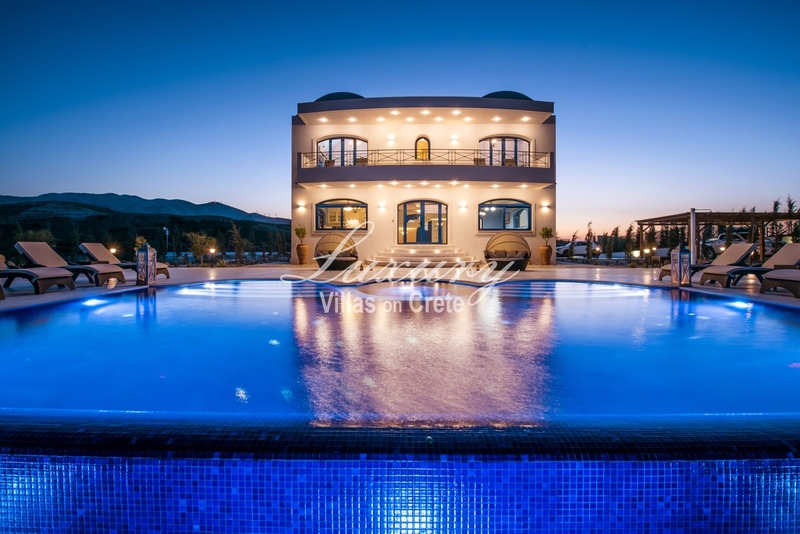 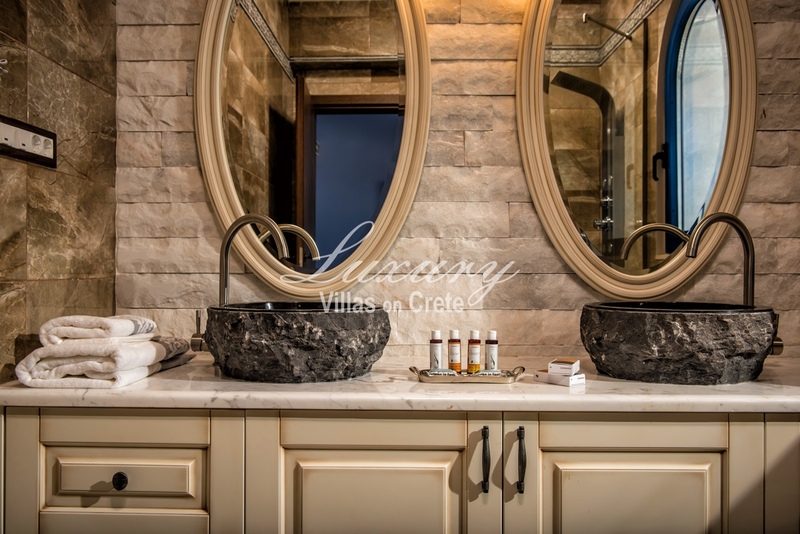 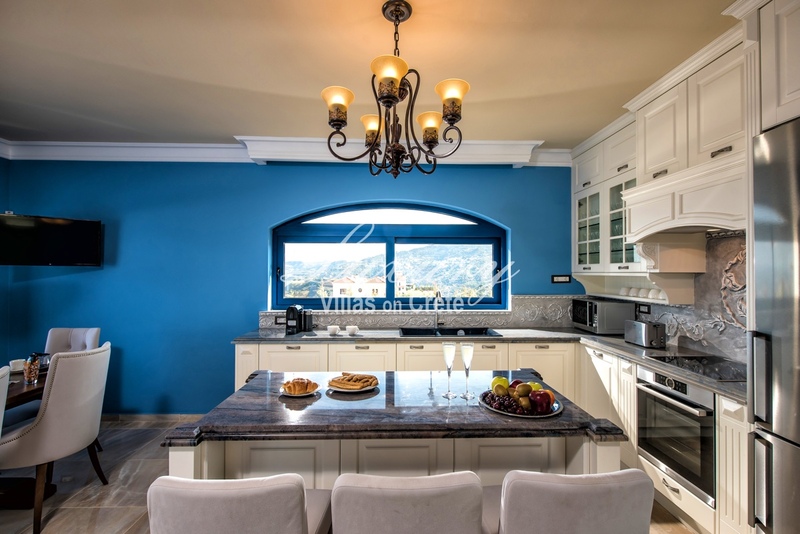 The villa is surrounded by hilltops of olive groves in the distance and has a sense of isolated peace from the noise of the city, while being only 15 minutes away from the city of Heraklion and 5 minutes from the beach town of Agia Pelagia. 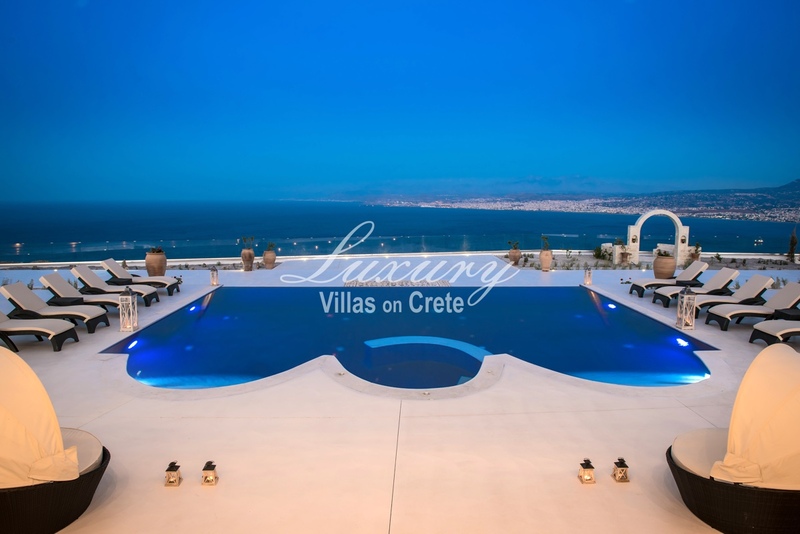 The pool overlooks the cliff and sea and leaves the guest feeling like they are suspended in the heavens, enjoying the combination of the blue sea and blue skies and the Cretan sun. 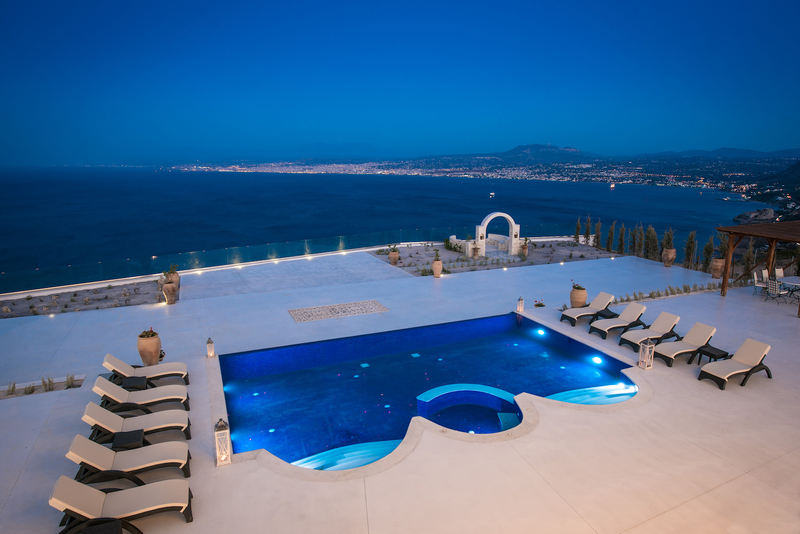 The night skies are just as impressive, with the starlight over the pool water that also has illuminated star lights within its waters. 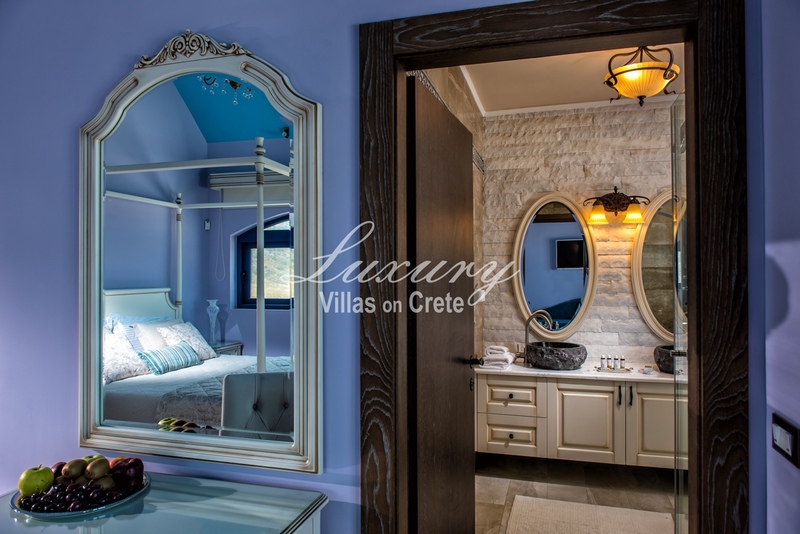 The private gardens around the house have fragrant and colorful trees surrounding the house adding extra privacy to the discerning guests. 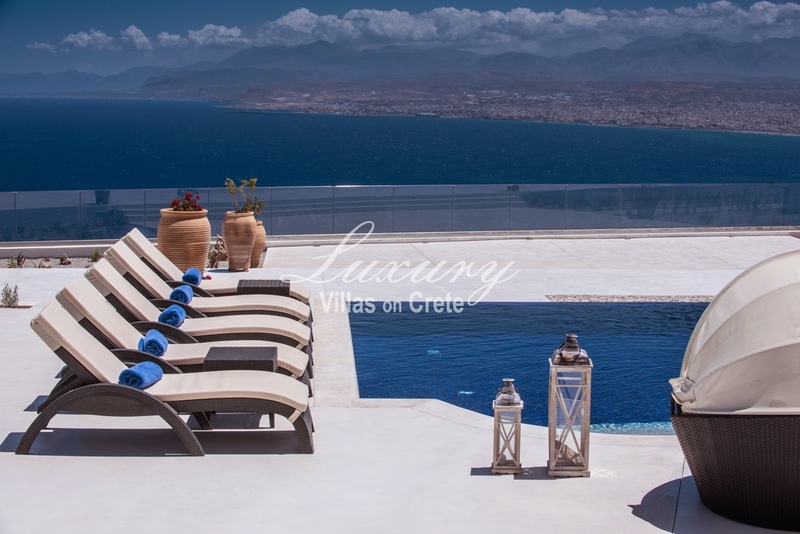 This villa is for the total Greek escape. 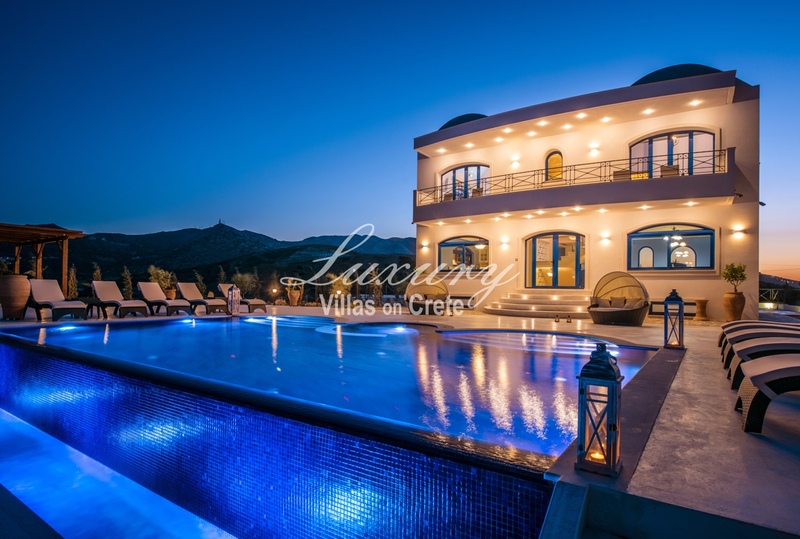 The villa comprises three levels of living space. 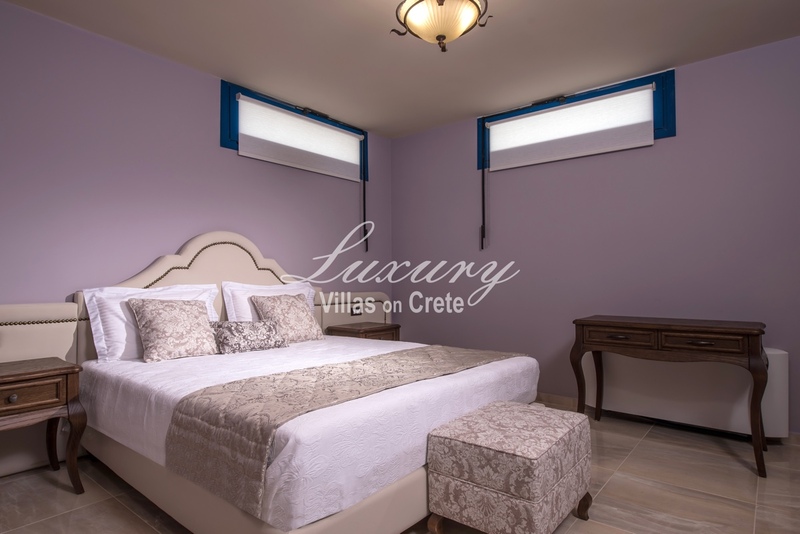 Level one, has to large bedrooms with two bathrooms and a washer dryer, ironing board and mini kitchen. 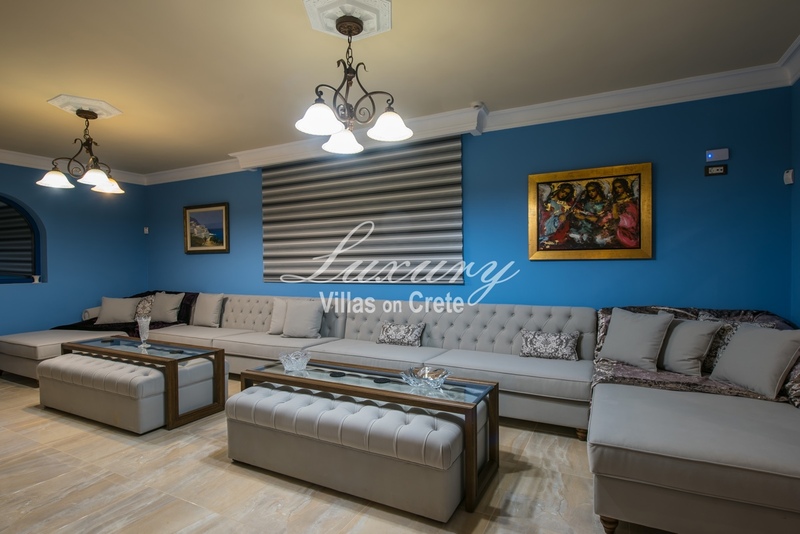 On the second level, is the spacious living room with a spacious kitchen and bathroom. 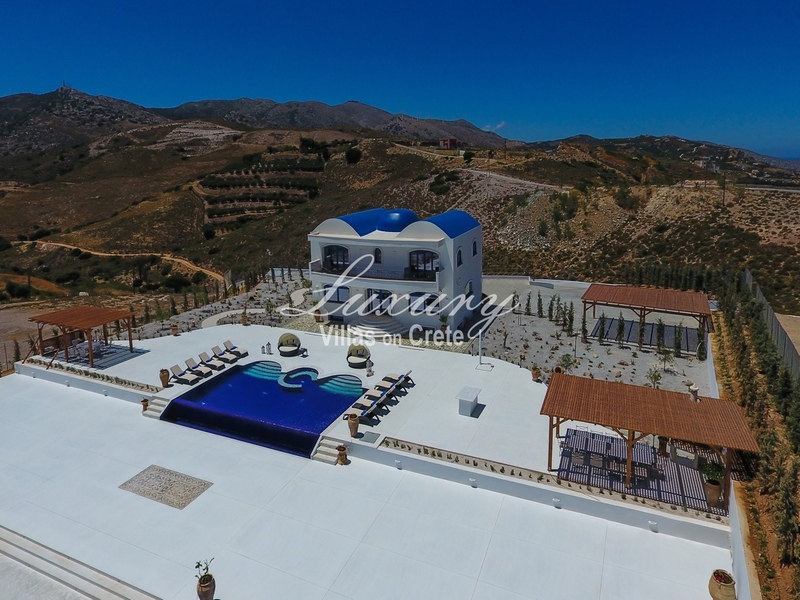 The living room opens out to the spectacular pool patio and sitting/sunning area overlooking the incredible Cliffside views. 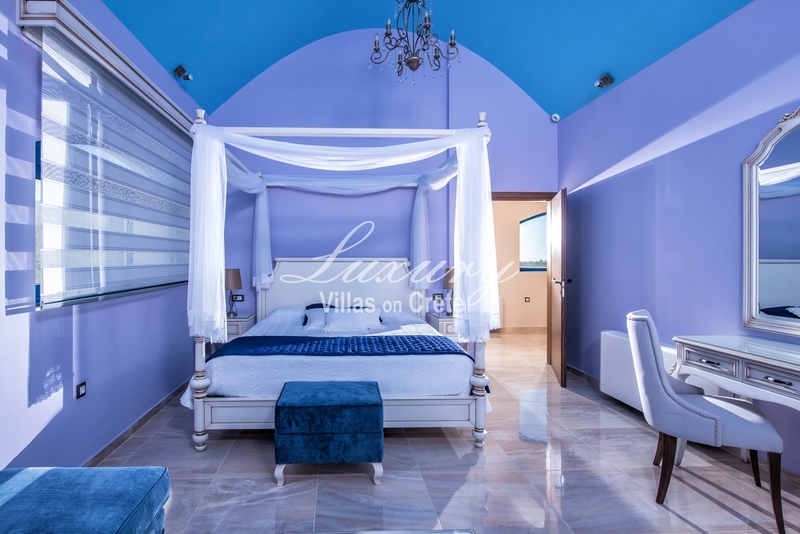 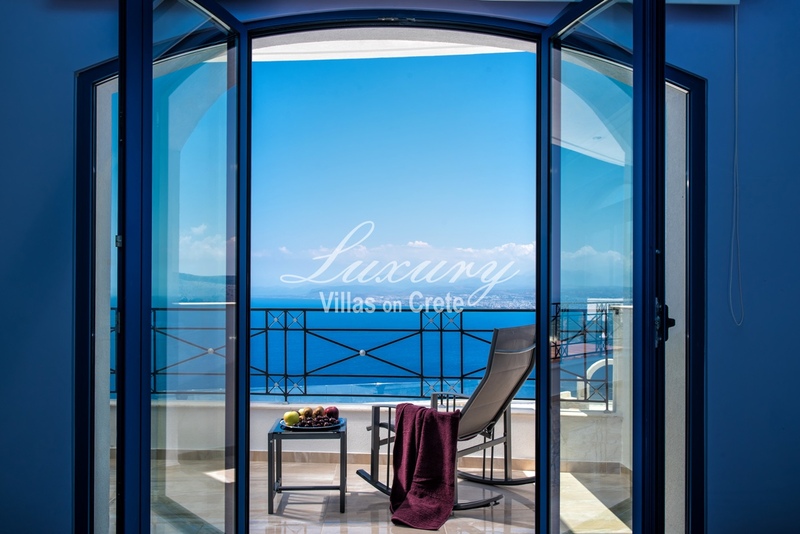 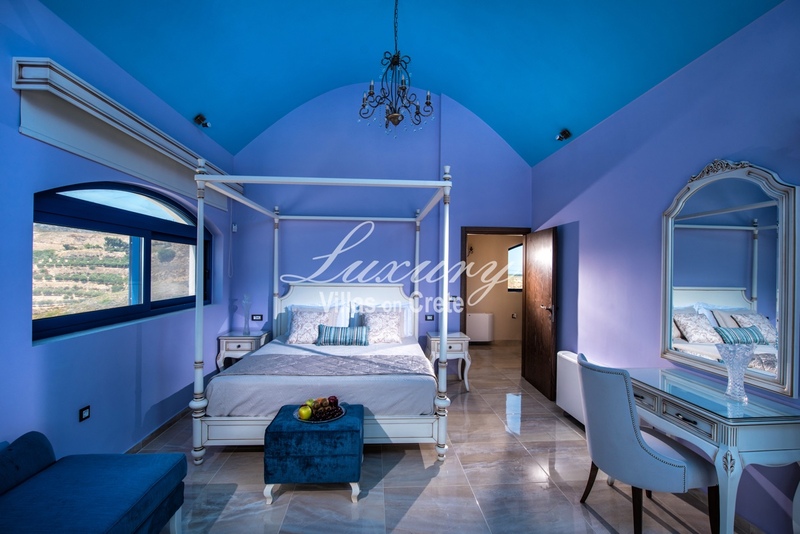 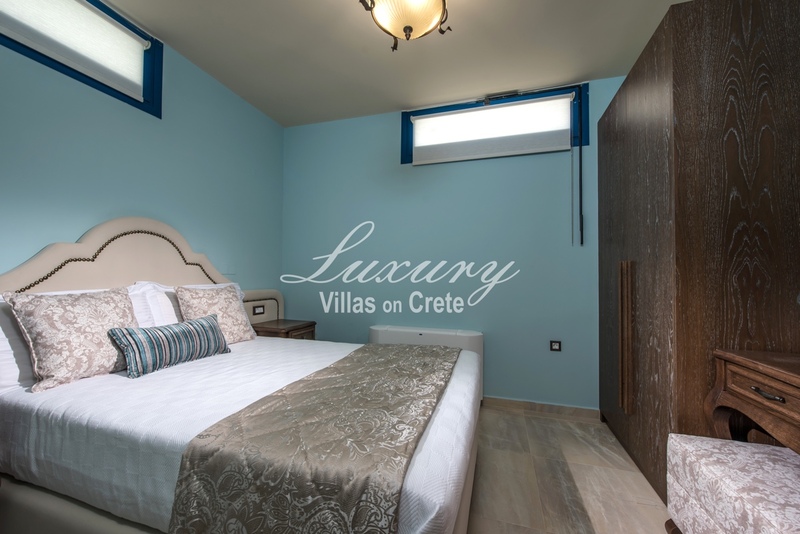 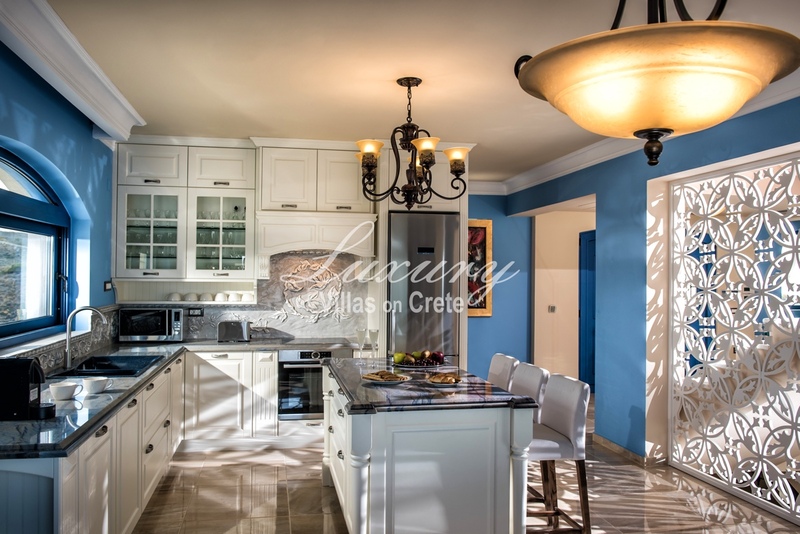 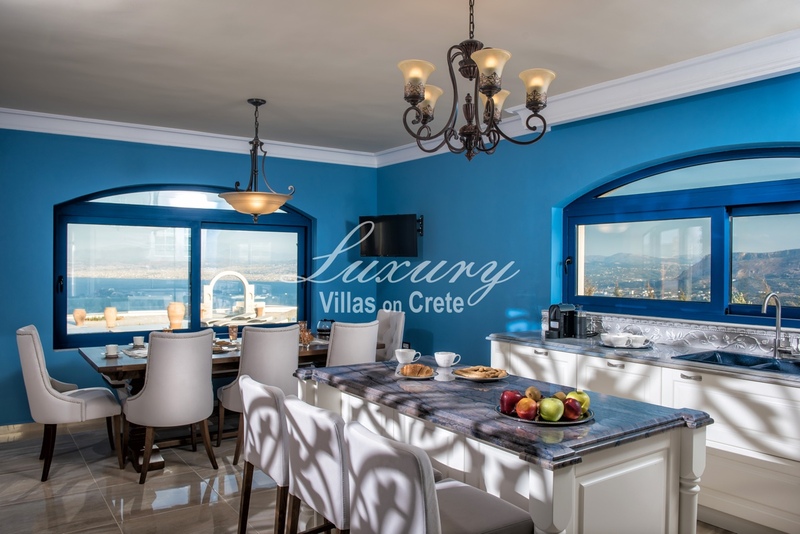 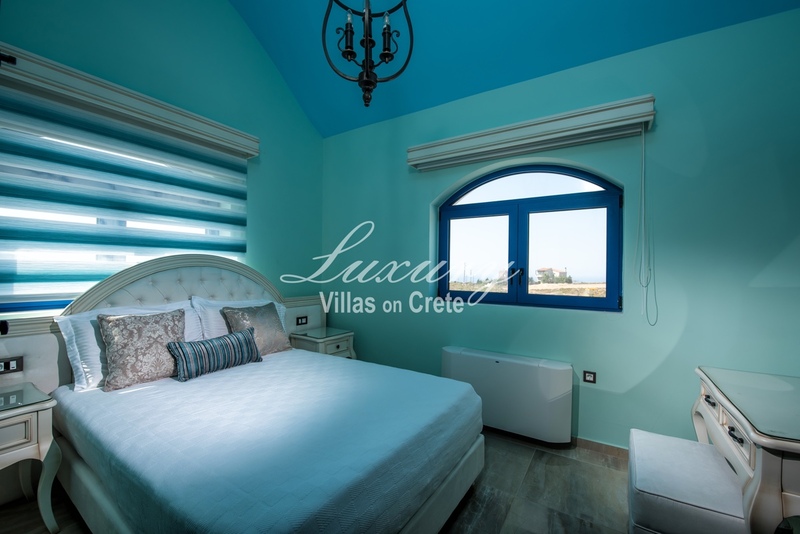 On the top level are three gorgeous bedrooms overlooking views of the Cretan Sea and countrysides. 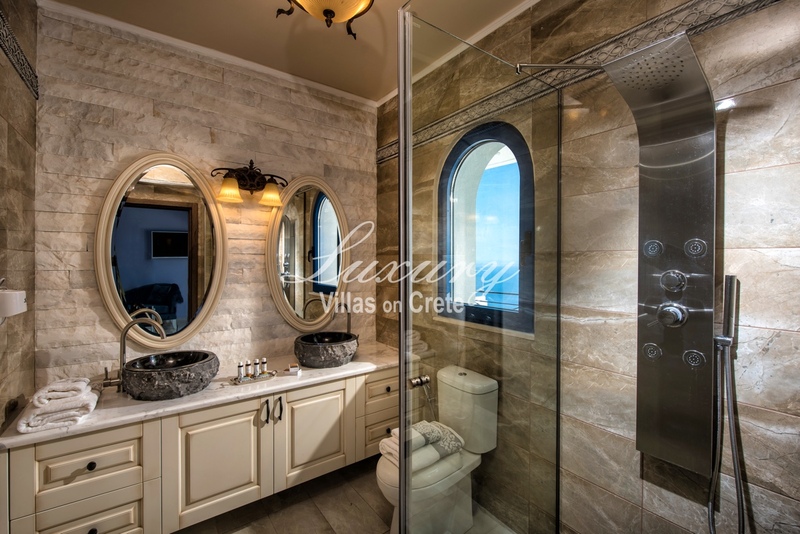 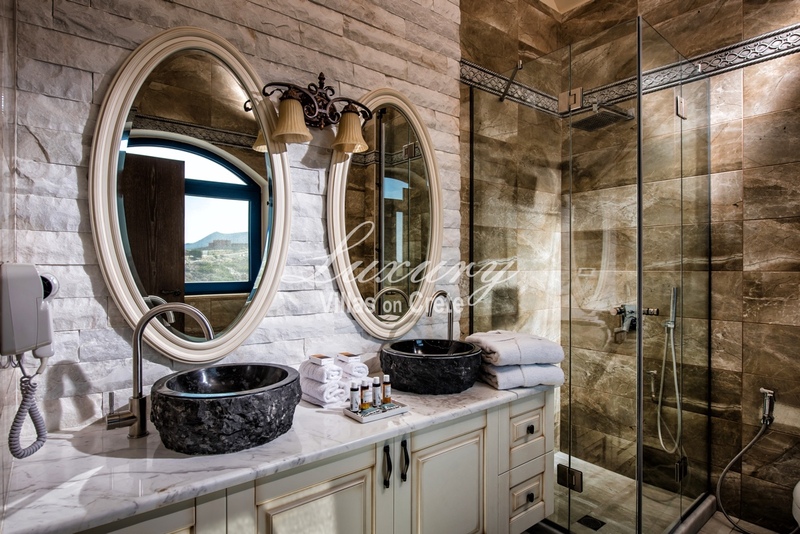 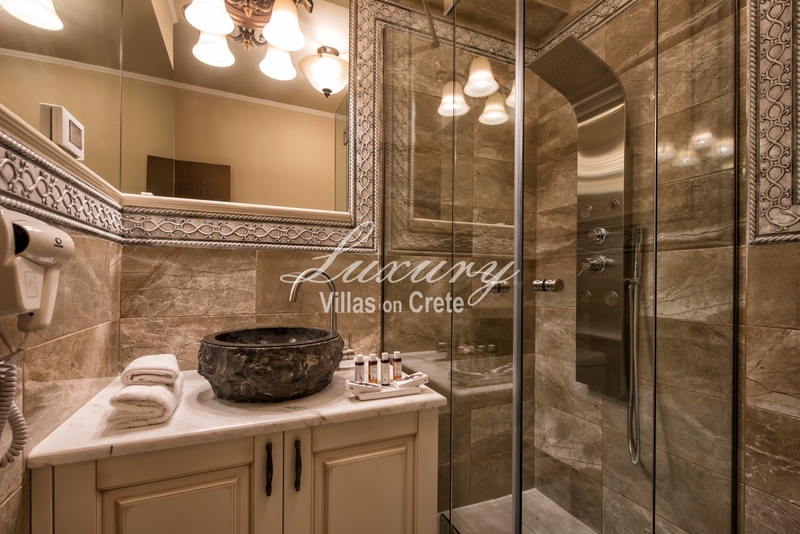 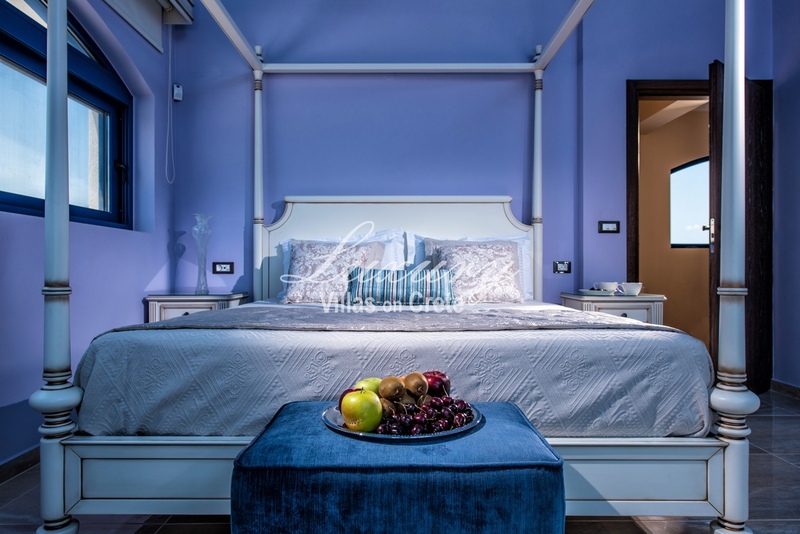 The master bedroom has its own private bathroom and the two other bedrooms share a bathroom. 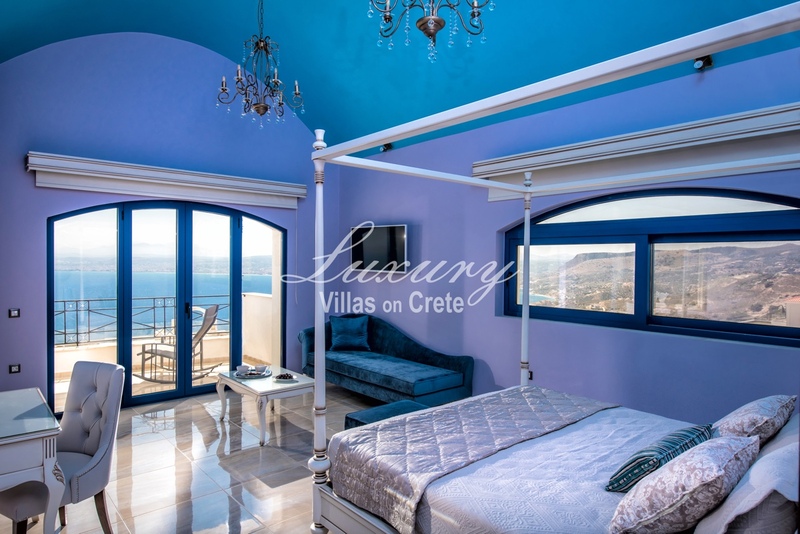 There are balconies over the bedrooms which have incredible views of the sea and sky. 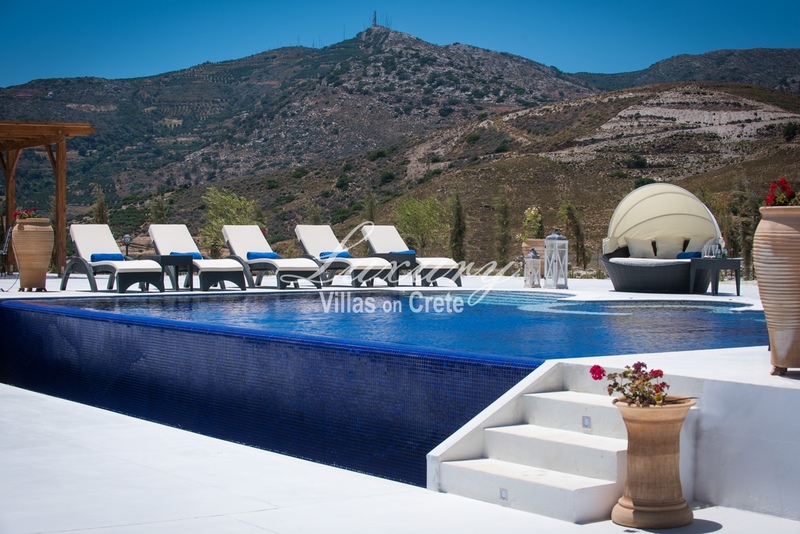 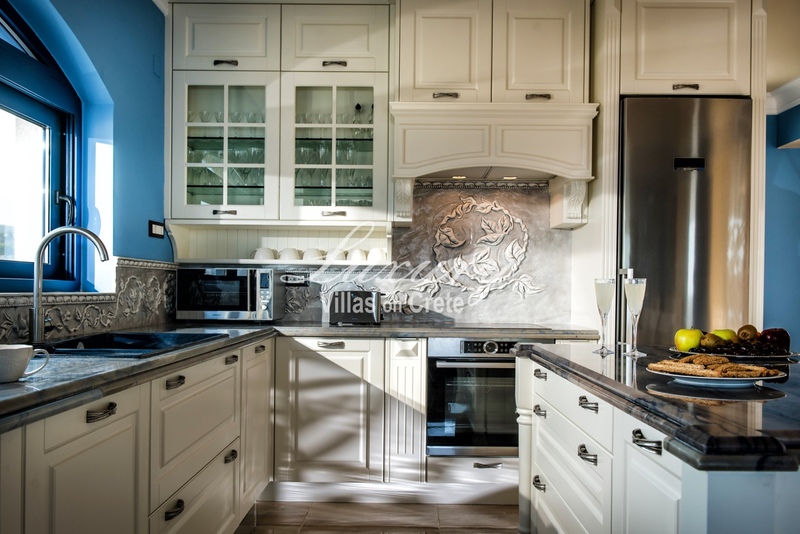 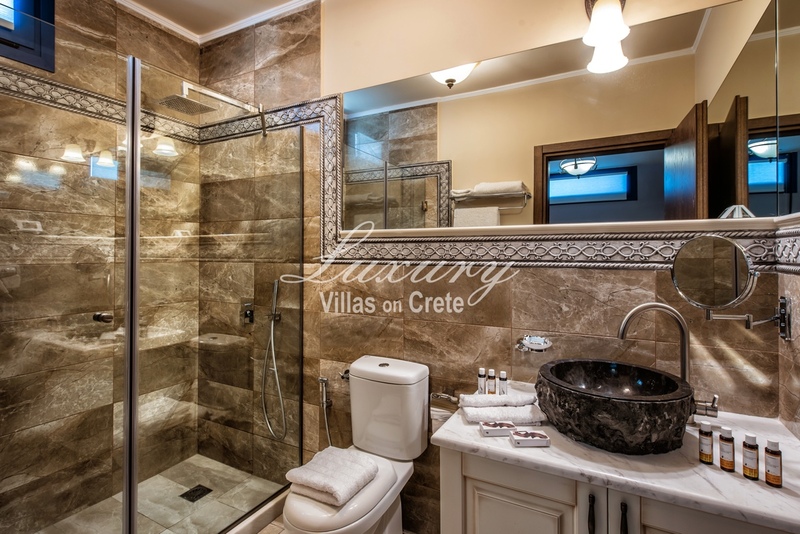 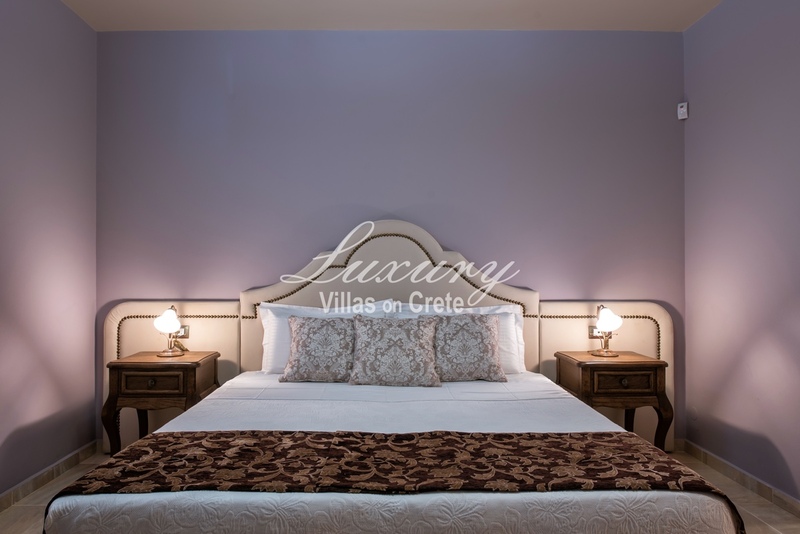 The villa is located in a beautiful beach resort town 6.8km drive from Agia Pelagia.